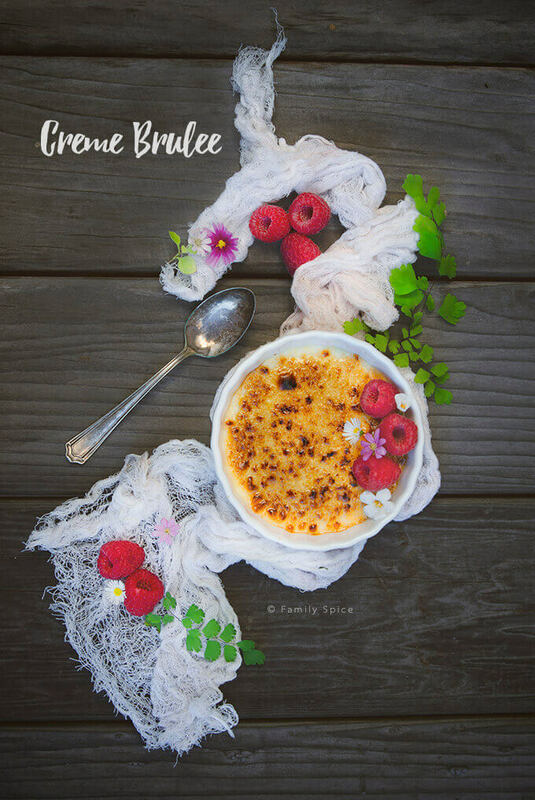 Hard candy top with a silky creamy interior, Ina Garten Creme Brulee is still a beloved classic and the Barefoot Contessa makes it easy for us to recreate! I am very excited for today is my first entry with a blogging group I just joined, Barefoot Bloggers. 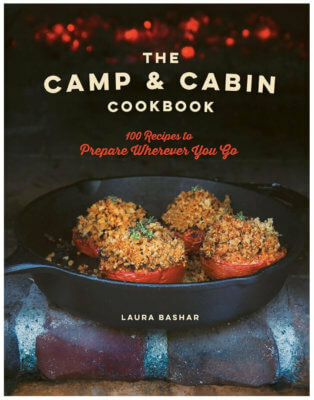 It is a blog for fans of Ina Garten, the Barefoot Contessa, and her amazing and delicious recipes. There are just some chefs that get it right every time, and Ina Garten is one of them. Now some of her recipes can be a bit rich, but they are always delicious. We are going to be making a variety of her recipes, from desserts to appetizers to main dishes. So let’s get started with today’s recipe! 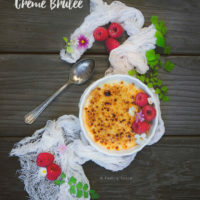 Creme brulee is a French dessert. It’s actually spelled Crème Brûlée, with all the accents. But here in the US, we tend to drop those pesky accents and just spell it without them. It is a rich dessert made with eggs, heavy cream and sugar. The custard base is flavored with vanilla and baked in individually sized ramekins. 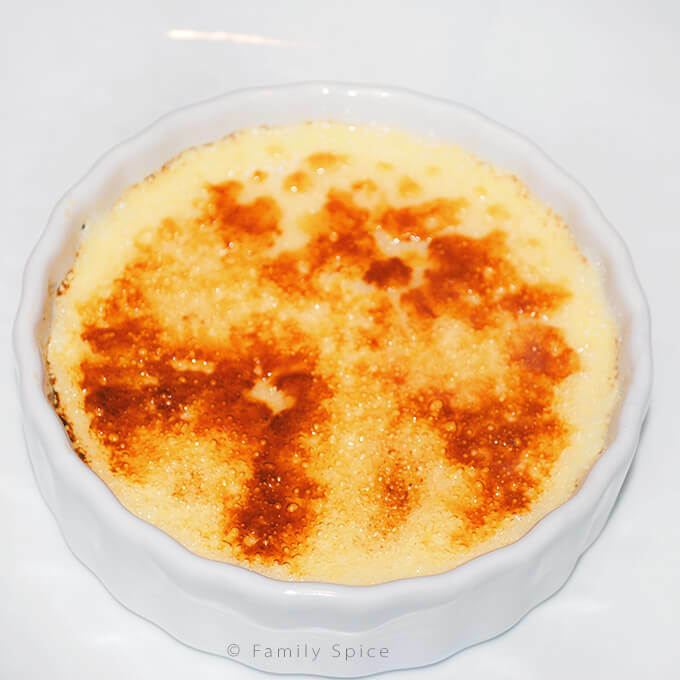 Each ramekin of creme brulee is topped with a hardened caramelized sugar. Although this recipe was first discovered over 300 years ago, it became popular in the 1980’s. This French recipe became a symbol of the finest and most decadent dessert you could offer your guests. I suppose Ina Garten’s appeal to the public is that she is a self-taught cook and not a classically trained chef. So if Ina can master the infamous creme brulee, so can anyone, including me. This recipe is from Ina Garten’s cookbook: Barefoot in Paris. Now this dessert has a little history with me. My husband is not a big dessert fan. But one of the desserts he does love, is creme brulee. On the other hand, I am a HUGE dessert fan and guess what? One of the desserts I least care for is? Drum roll, please! Yes, creme brulee. Needless to say, I don’t make it often! ha! ha! My poor hubby! 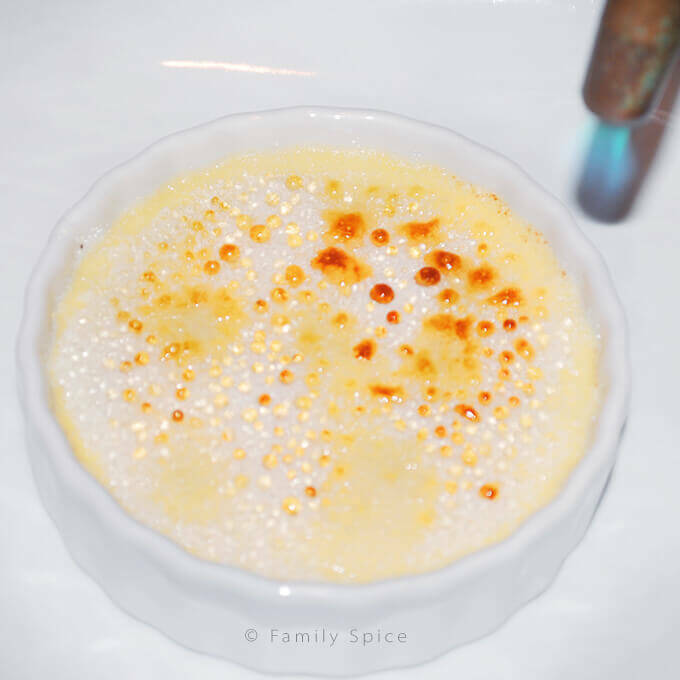 I was a bit nervous and intimidated to make this creme brulee. It requires scalding the hot cream and I didn’t want to ruin the dish by curdling the eggs. My husband, the engineer, is incredibly particular and texture and I wanted to impress him with my mad cooking skills making his favorite dessert. The key to not curdling the heavy cream is watch over it while you heat it up. You bring the cream right up and before it starts to boil. You have lots of visual cues to help you in this stage, lots of steam and the beginning of small bubbles at the rim of the cream. Once the heavy cream is scalding hot, you add the egg and sugar mixture. To insure that the eggs don’t curdle from touching the hot cream, you need to temper them. Pour a tiny bit of hot cream and whisk it into the egg mixture. This helps heat the eggs up slowly. Now that the eggs are warm, you can slowly add the egg mixture and whisk it into the hot cream without any fear of curdling your eggs. Divide the creme brulee mixture into your ramekins and place in a pan filled with water. This helps bake the custard evenly. 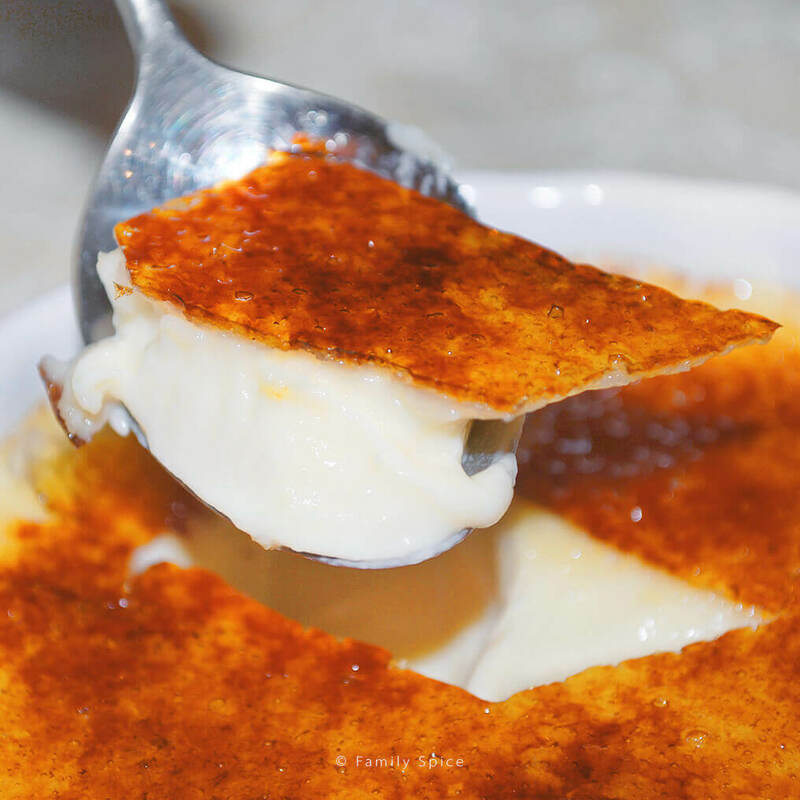 Creme brulee, no matter if it’s the Barefoot Contessa’s recipe or someone else, is famous for it’s hardened caramelized sugar topping. This step is added right before serving. So if you are serving this dessert at a dinner party, you can bake and chill the creme brulee a few days before the event. 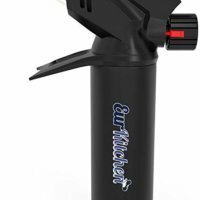 Then using a kitchen torch, hold the flame about an inch or two away from the sugar and start melting the sugar. You will watch the white crystals start to melt and slowly turn an amber color. You can bring the torch closer to the sugar if it isn’t melting or browning, but be sure not to hold it too close or your might burn the sugar and blacken it. You want the surface to be golden brown and amber. If you do not have a kitchen torch you can also brown the sugar using your oven broiler. Simply place the ramekins on a baking sheet and place under the broiler for a few minutes. Again, keep an eye on the creme brulee and make sure it doesn’t burn. Remove the ramekins when the topping is browned and golden. 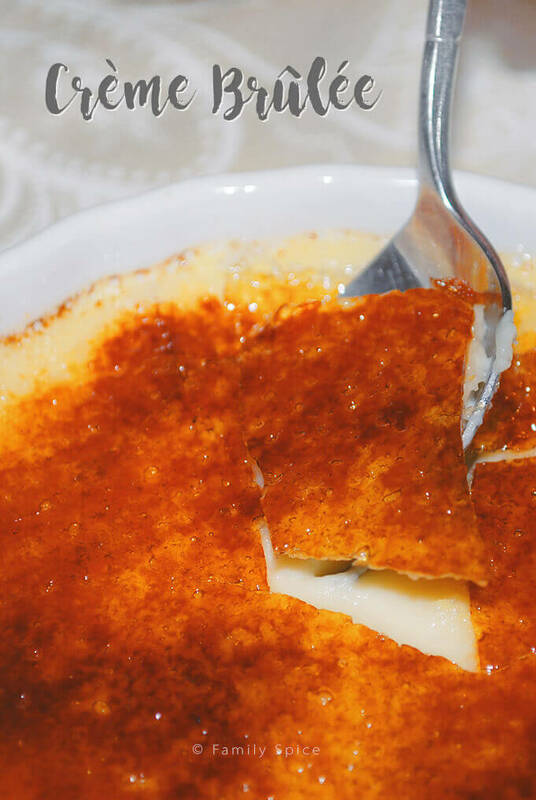 Creme brulee is a magnificent and elegant dessert on its own and does not require much more fuss upon serving. 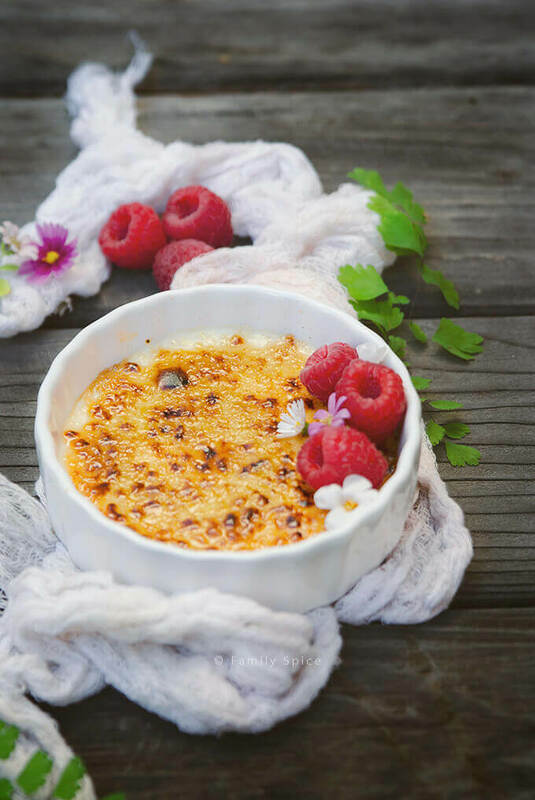 I like to top Ina Garten creme brulee with fresh berries that are in season. It adds a pop of color and the tart berries make a nice contrast with the sweet custard. 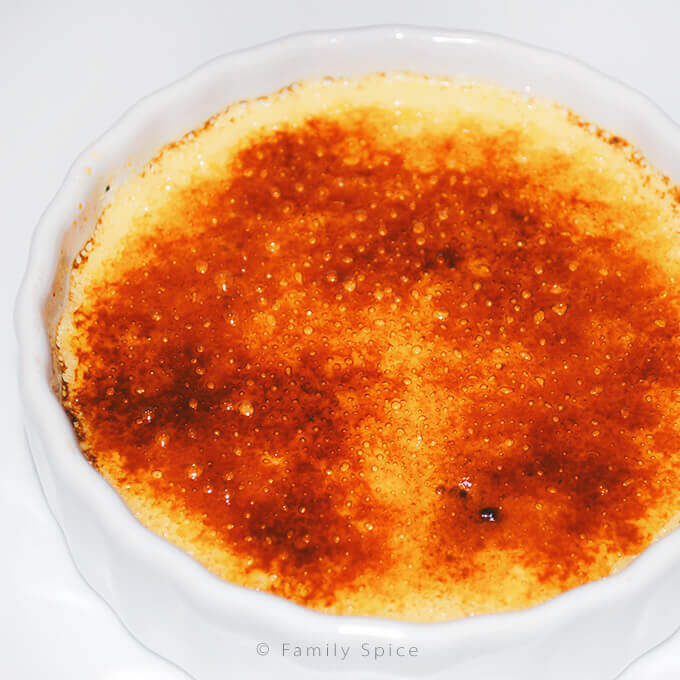 Creme Brulee can appear to be very intimidating, but I found it to be extremely easy to make. Scalding the cream means you have to watch it and not walk away, because you don’t want it to boil and curdle. It’s like watching your kids and making sure they don’t break your mother-in-law’s fragile crystals! I found the hardest part of making Barefoot Contessa creme brulee was to keep the water from the roasting pan from dripping into my full ramekins as I was placing it in the oven! I think next time I will place the water filled pan in the oven first and then place the ramekins directly in afterwards. And what did my picky husband think about my hard work? My man thought this was one of the best Creme Brulee recipes he had ever eaten. The texture was velvety and smooth. The vanilla and Grand Marnier provided excellent flavor. Even I didn’t mind eating the dessert. Yup, Ina did it again! 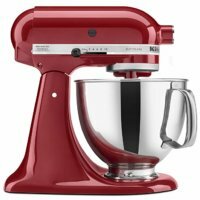 In the bowl of your stand mixer fitted with a paddle attachment, mix eggs and 1/2 cup sugar on low speed until combined. 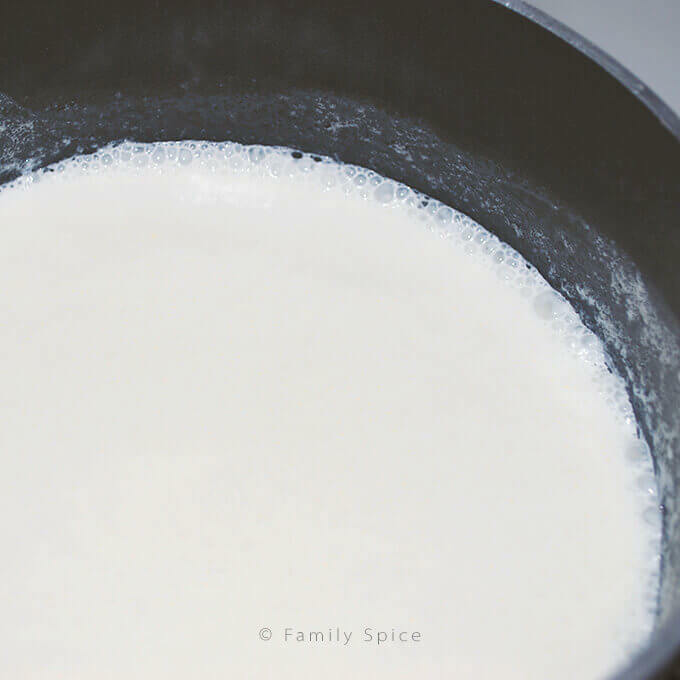 Scald heavy cream in a small saucepan until very hot to touch, but not boiling (to prevent curdling). 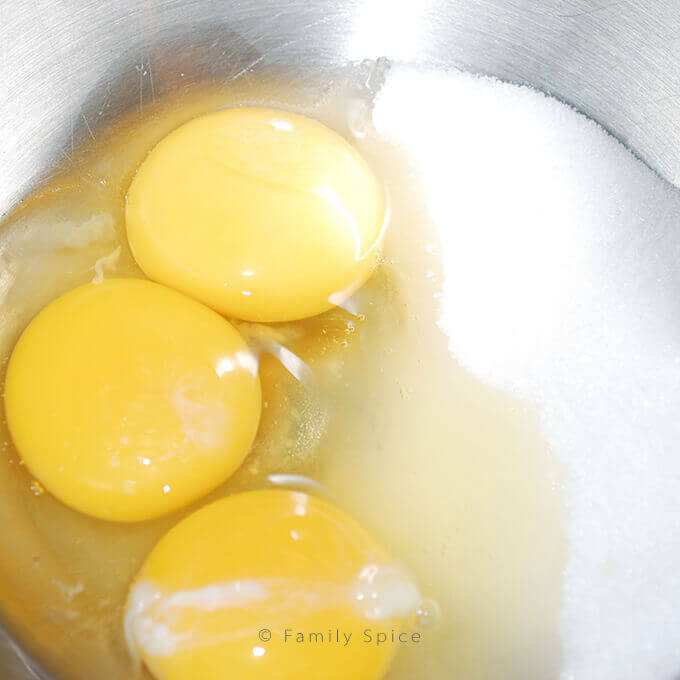 With the mixer on low speed, slowly add the hot cream to the egg mixture. Mix in vanilla and Grand Marnier. Pour into 6 8 oz ramekins until almost full. Place ramekins in a large roasting pan and add enough hot water to pan to come halfway up the sides of ramekins. Bake until custards are just set in center, about 35-40 minutes. Remove custards from roasting pan and allow to cool to room temperature. Chill custards until firm, about 1 hour. 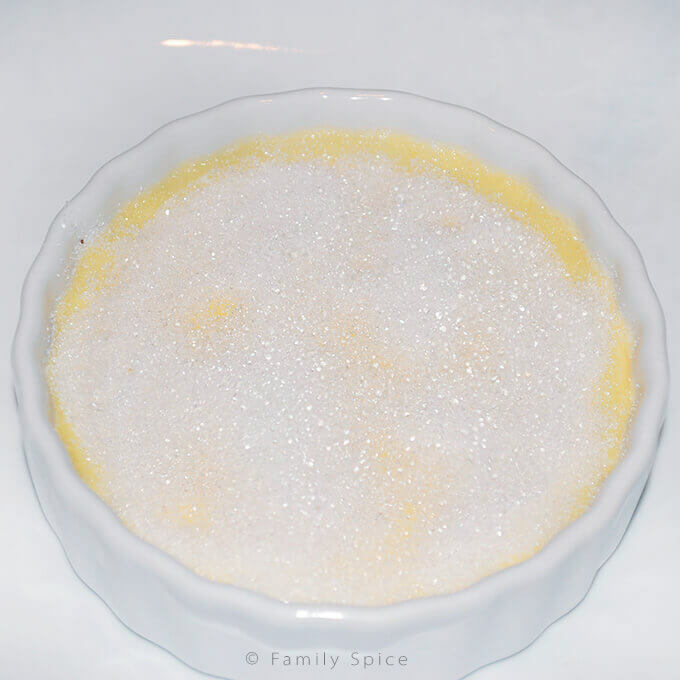 When ready to serve, sprinkle remaining sugar over each custard in each ramekin. Using a kitchen torch, melt sugar until deep amber. You can also use the broiler. 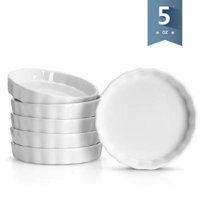 Place ramekins on rimmed baking sheet. Sprinkle tops with sugar and melt directly under broiler until deep amber. Refrigerate 15 minutes to allow sugar to harden. They can be made 1 hour ahead. Keep chilled. Serving Suggestions: Serve alone or with fresh berries. I love the idea of adding Grand Marnier to it–like a grown up, super elegant creamsicle! Who said adulting has to taste bad? !